Significantly higher production quarter-on-quarter at Zinc India. Gamsberg zinc project on track for mid-calendar year 2018 production. EBITDA is up by Rs. 1400 Crores, 40% higher year-on-year basis with an EBITDA margin of 36% driven by strong operating performance. Depreciation and amortization decreased due to change in depreciation methods consequent to the accounting guidance changes under Ind AS in the oil & gas business effective 1st April and lower mine production at Zinc India. 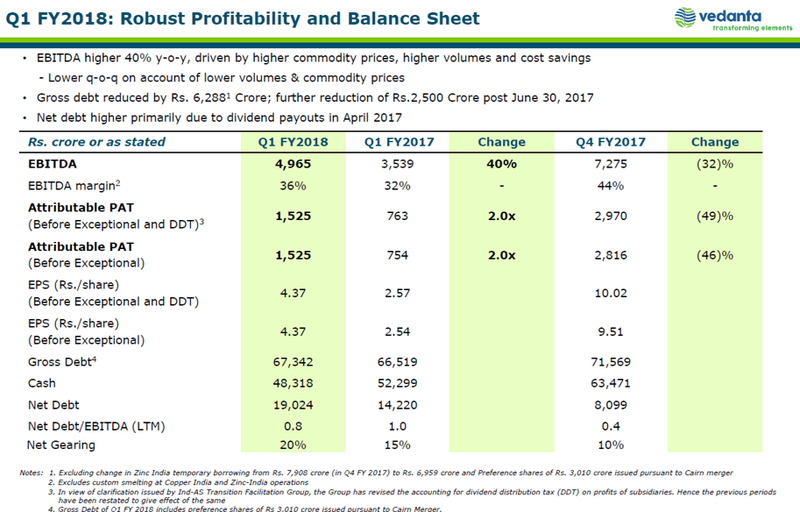 Q-o-Q Finance cost marginally increased due to capitalization of new capacities at aluminium, temporary borrowing at Zinc India offset by lower interest rate and gross debt reduction. Term debt refinanced 80 basis points to 100 basis points, overall cost of borrowing is likely to be 20 basis points to 25 basis points lower than last year. Blended rate of return on investment for the quarter was around 6.7%, reflecting the interest rate curve as well as the mark-to-mark on the bond investments. The tax rate guidance for the year at mid-20s to 30% as articulated during the May 2017 meetings still holds. Zinc India went through a successful transition from open cast to underground mines in thelast 12-months with significant increase in the current quarter volume. Hindustan Zinc business commenced the year achieving mined metal production of 233,000 tons. Despite of a plant shut down at Skorpion, delivered a strong EBITDA because of higher sales volume of Black Mountain. Cost of production was higher at $1,690/t due to shutdown at Skorpion. The Gamsberg project is on track for first production bymiddle of calendar year 2018 andphase-1 is expected to give 250,000 tons of zinc production. Phase-2 could be another 180,000 to 200,000 tons. FY 2018 production and cost of production guidance at Skorpionremains unchanged with production of about 160,000 tons and cost of production at $1500/ton. Commenced growth journey on both exploration and development fronts. Co-fields continue to deliver along expected lines with gross production across three assets at 187,000 boepd for the quarter. Rajasthan production was around 160,000 bpd. Mangala EOR continues to deliver strong performance with a volume of 56,000 barrels a day. The Rajasthan asset recorded an uptime of over 99%. Gas production from RDG increased to average of 35 million cuffs per day. Commenced production from two satellite fields named Cambay II and Gudha in Rajasthan. Offshore assets also recorded excellent uptime of over 99%. Operating cost at the lower end among global peers. Rajasthan water flood OPEX was 5.5% lower than Q4 at US$4.3/barrel. Blended operating cost for Rajasthan was also lower by 1.2% at US$6.2/barrel with the polymerized liquid injection at 420,000 bpd in Q1. Liquid handling capacity will go up from 950,000 to 1200,000 bpd increasing water injection capacity from about 650,000 to 850,000 bpd. Bhagyam EOR field development is under discussion withJV partner ONGC. The Field Development Plan for Aishwariya EOR is also under discussion with a JV partner. The fiscal 2018, is expected to have steady production volume from Rajasthan at 165,000 bpd with the potential upside from the execution of growth projects. Re-commencement of investment in the exploration and development projects to realize the full potential of the Barmer basin. Target of 500,000 barrels per day has been set for Barmer basin which would contribute to 50% of India’s domestic production. The BALCO 325,000 tons smelter is fully operational and capitalized. There was on outage at 500,000 tons Jharsuguda-I smelter in April 2017 that damaged 228 out of total 608 pots. 35 pots have been restarted. The second line at Jharsuguda-II has been fully ramped up and capitalized. Realized significantly higher premium on year-on-year basis because of increase in alumina prices. Hot metal costs were $1,727/ton, mainly because of higher import prices for alumina, Indian rupee appreciation, increased input cost and some temporary cost pertaining to pot outages. 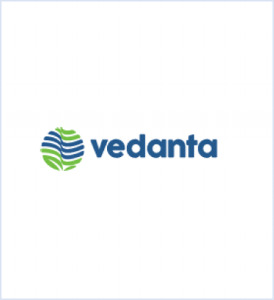 As production cost of Lanjigarh alumina is much lower than the purchase cost of seaborne alumina, Vedanta is increasing procurement of own and third-party bauxite which will allow to ramp up Lanjigarh. Estimated hot metal cost production in the second half of the fiscal 2018 to be between $1,575 to $1,600/ton. Expected fiscal 2018 alumina production in the range of 1.5 MT to 1.6 MT implying about 50% of alumina requirement is met via captive production. The company continues to work with the Odisha government on the allocation of bauxite to drive future expansion at Lanjigarhrefinery. BALCO 600 MW and Jharsuguda 600 MW sequentially lower offtake in the first quarter. Long-term power purchase agreements for about 60% ofthe 600 MW capacity of BALCO which are being substantially met and serviced. The 100 MW Nalco power plant is under care and maintenance effective from the 26th May 2017 due to lower demand in southern India. The plant generated a significant cumulative EBITDA of about $170 million over eight years. Observed temporary disruptions in domestic coal supply, which meant some increased power costs. Reduced dependence on importedcoal at BALCO and Jharsuguda despite increasing coal requirements. Secured 2 mt of coal linkages in July during the linkage auctions. This is in addition to the 6 mt that was secured a year ago to ensure longterm security of coal sourcing at competitive price. Achieved a sales of 2.28 mt and production of 3.24 mt. Production at Goa was lower primarily due to the early onset of the monsoon as well as the temporaryhalt in mining in some areas by the government. Sales dipped due to lower pricing environment and a widening of discount for 56% grade as compared to the 62% iron grade. To improve realizations per ton and narrow the current discounts, working on product upgrade with higher grades so that overall iron content is increased to about 57.7% grade as well as the alumina content is reducedfrom 4.2% to3.5%. At Karnataka, achieved 50% of annual mining cap reproduction of 1.09 mt during the quarter. Sales were lower at 0.42 mt due to muted e-auction sales. Beneficiation of ore, however, has resulted in improved prices at $24/ton compared to $18/ton in the first quarter of fiscal 2017. Copper India production was about 90,000 tons of cathodes. Production was lower due to plant shutdown for 11 days for maintenance and 4 days due boiler leakage. TcRcs has been at $20.08/pound on account of reduction of global benchmark to TcRc rates and lower spot TcRcs. Over 80% of concentrate requirement are sourced through long term agreements. Lower commodity prices during the quarterexcept for aluminium where Chinese efforts to restrict excess capacity in aluminiumhelped. Aluminium LME continues to shift to positive buyers for the first time in nearly a decade. India’s strong demand growth for gasoline and diesel is continuing and is likely to continue for the next several years. Over the longer-term, surge in electric vehicles will increase demand for base metals like copper, aluminium and lead giventheir extensive usage in transportation system and also electric batteries. Urbanization and industrialization will continue to drive demand in all of sectors such as construction, transportation and infrastructure. The continued shortage of new supply and the continuous draw down of refined zinc inventories have led to multi-year low stock levels, some ofthem going back more than 10-years.